Dresses for work, career dresses, and casual dresses for the office are a comfortable and fashionable way to showcase your personal style and remain appropriately attired at the office. A career dress from Simply Dresses will show your professional style and help give you the confidence to take on the world. Shop this selection of designer career dresses for the busy working woman to find your ideal look. You'll find short work dresses from some of the hottest designers, including Sherri Hill, Jovani, Mori Lee, and many more. We have short career dresses in solids and prints and little black dresses that go from day to evening. If you’re looking for a cheap work dress, we have you covered. Browse this assortment of designer dresses for work to find a variety of styles and designs at affordable prices to help you expand your work wardrobe. What Types of Dresses are Appropriate for the Workplace? Dresses for work can vary greatly depending upon the formality of the office or meeting you’ll be attending. Choose wisely when you select your career dresses, as you want to ensure you select a dress for work that will send the appropriate message. A knee-length peplum dress in a strong navy or basic black is an powerful look for the next board meeting. A fit-and-flare or a-line style dress would also be an appropriate dress for work as long as the neckline is modest. Short print dresses and casual dresses can be work dresses if the formality of your office setting allows them. A gorgeous floral print high-low dress or casual shift dress is the ideal way to showcase your unique fashion sense at the office on casual Friday. Work dresses don’t have to be dark colors. You can also wear beautiful jewel-tone work dresses or soft pastel career dresses. 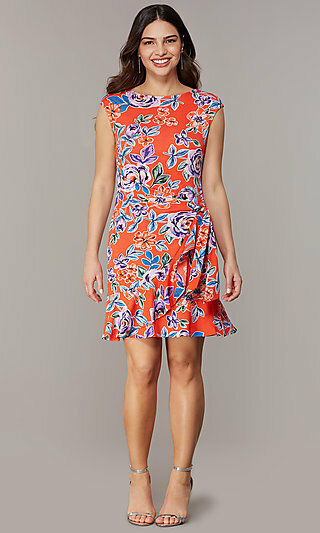 Lively print career dresses are perfect for brightening up the office. If you’re not sure what dress to wear to work, the classic little black dress is always in style. This wardrobe staple is the perfect dress for work and transitions easily if the meeting runs into cocktail hour. Choose the dresses you wear to work wisely, and your work dress can take you from a day of work to a night out on the town. Lace and pearls are all the rage. A work dress with just a touch of a lace sleeve or pearl buttons can be feminine and still professional, and you will be fashionably dressed to go from work to an evening out with friends.